I'm just back from stunning Salthill on Galway Bay where I was at the Conference of the Psychological Society of Ireland's Division of Behaviour Analysis. It's the annual meet up for those who want to geek out, discuss the finer points of 'reinforcement schedules', and get excited over graphs and pie charts. I suppose it’s not everyone’s idea of a good weekend, but it certainly was mine. There are some really brilliant innovations happening in the field of behaviour support at the moment. These include some forward thinking assistive technologies, which have a strong theme of being affordable, accessible and do-able for people with additional needs and their families. There were buckets of presentations showing real innovation in practice, much of which is designed to empowered families and teachers; and also practices to deliver support quickly and efficiently without compromising on quality. 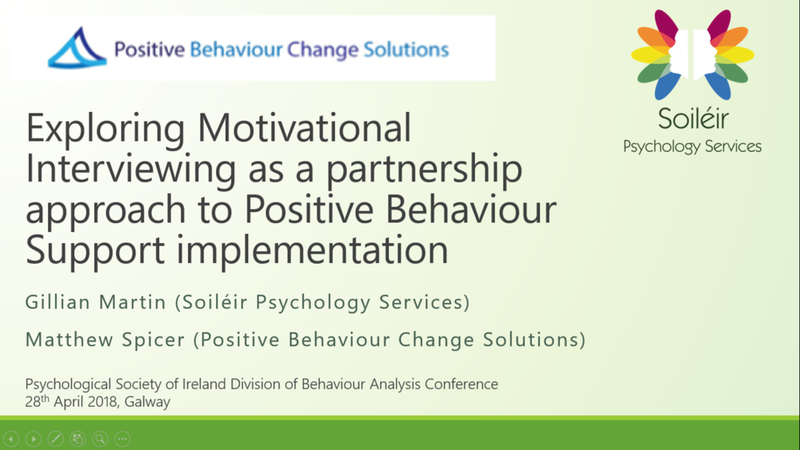 For the conference, Soiléir partnered with Matthew Spicer of Positive Behaviour Change Solutions (PBCS) in Tasmania who has extensive experience working across the disability and out of home care sectors as a psychologist. We delivered a paper that looked at Motivational Interviewing as an approach to maximise efficiency and efficacy in increasing quality of life when using Positive Behaviour Support. If you want a copy, download it below and feel free to get in contact with any questions.